Our retirement wishes, greetings and phrases provide a resource for when you’re looking for the right words for a valued colleague, family member or friend who is taking the big leap into retirement. For many retirees, the step away from full-time employment is something they’ve dreamed up for a long time. Recognize the importance of the day with some carefully chosen words that leave the impression that you want them to. Check out the retirement wishes, phrases and saying to see if any of the messages resonate with you. 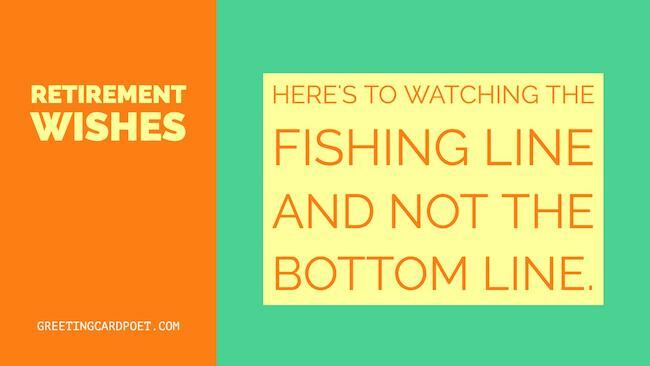 Here’s to watching your fishing line and not the bottom line. How you managed to retire at this young age is a testimony to your intelligence. Retirement is a celebration: old memories and new beginnings. Every day is a weekend when you’re retired. They’ll have a hard time filling your shoes. Happy Retirement! Congratulations on your total freedom! No more excuses for not posting selfies of your vacations. You know all those things you wanted to do? You should do them. Don’t quit your daydream – Happy Retirement! Retirement only means it’s time for a new adventure. When you stop living at work and start working at living. I’m going to retire and live off my savings. What I do the second week is anybody’s guess. Retirement: Having a good time is my job. I’m retired – don’t ask me to do a damn thing. Have you ever been out for a late autumn walk in the closing part of the afternoon, and suddenly looked up to realize that the leaves have practically all gone? You hadn’t realized it. And you notice that the sun has set already, the day gone before you knew it — and with that a cold wind blows across the landscape. That’s retirement. Retirement is a field of clover, but by the time you reach it, you’re too old to climb the fence. Retirement is the period in life when you stop quoting the proverb that time is money. Let’s put a limit to the scramble for money…. Having got what you wanted, you ought to begin to bring that struggle to an end. Avoid retirement playgrounds like poison, because that’s exactly what they are. If you’re retiring, here are a few words of advice on how to give a short speech to your colleagues at work. Tip 1: Keep it short. A.) Thank boss, colleagues and company for support through the years. B.) Briefly touch on a couple company, group or individual highlights. C.) Indicate how you plan to spend your retirement, e.g. reading more, travel and enjoying grandchildren. D.) Wish all good luck and continued success. Tip 3: Prior or after to speech, meet individually with the folks at your company who meant the most to you, your boss (whether this was the case or not), and your successor. If you’re recognizing a retiree, here are three tips. Tip 2: Be sincere and express heartfelt appreciation. Personalize your message to the retiree. Let the person know that he or she will be missed. Thank them for their contribution. Start sincere and end sincere. Tip 3: Add some humor to the middle part of your presentation. Bounce it off a trusted friend for a disaster check. Retirement is typically a happy occasion, and folks are looking for an opportunity to laugh. Provide them that opportunity in a good-natured way.